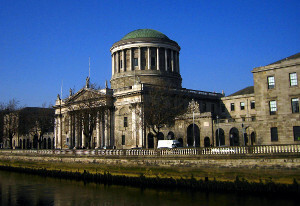 The Cobh-Glanmire representative’s application is set to be heard at the High Court in Dublin in May, the Irish Examiner reports. Judge Olann Kelleher said the matter had been adjourned numerous times in the District Court in order for the High Court to deal with this aspect of the case. The issue to be determined is whether the applicant, Diarmaid Ó Cadhla, 56, is entitled to have the case heard in the Irish language. He faces five counts of criminal damage to street signs at three locations in Cork city. Defence counsel, Pat Barrett, formerly said that one of his submissions was that a judge fluent in the Irish language should hear the case. The group Cork Street Names Campaign was established to have all streets in Cork named after the British queen renamed. It argues naming streets after Queen Victoria is an insult to the dignity of the famine victims.